Facing these growing risks, ELAW works to keep our partners safe by training them in physical and digital security measures; petitioning domestic, regional, and international human rights mechanisms; collaborating with them to identify and reduce risks; helping them build strong, robust organizations; and more. 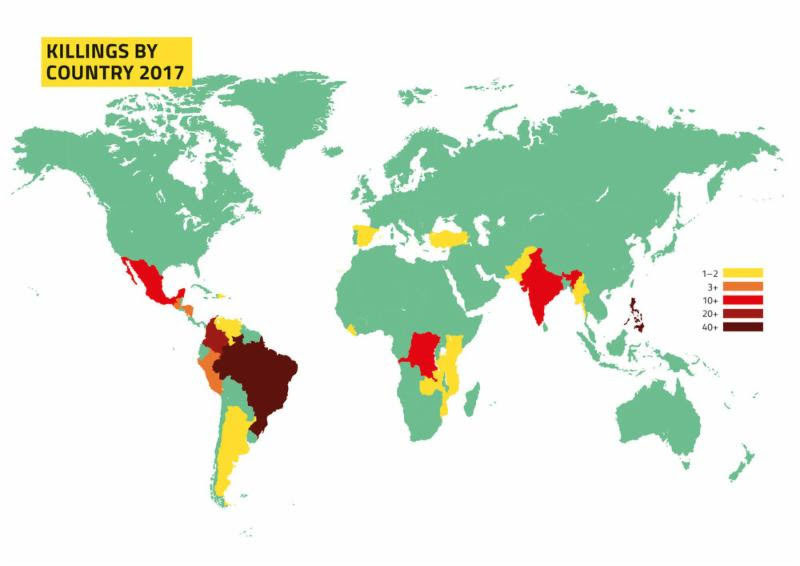 "International civil society organizations and stakeholders can act to prevent attacks, defend advocates and hold government and corporate perpetrators responsible for attacks on environmental defenders," says ELAW's [Bern] Johnson. He points to important organizations such as the Defending Defenders Coalition, under which ELAW and other NGOs are forming a joint advocacy strategy, and international and regional human-rights mechanisms such as the Inter-American Commission on Human Rights and the United Nations Special Rapporteur on Human Rights Defenders, which protect environmental defenders and advocates. Protecting these people, however, is not always easy. "Because each environmental advocate works in a unique situation, threats against them must be handled on a case-by-case basis," says Johnson. "What helps in one case might do harm in another." He says ELAW coordinates with local partners to help people "reduce their risks and make themselves less attractive targets."